Hyrbyair Marri, an exiled pro-freedom Baloch leader announced his new political platform, Free Balochistan Movement (FBM) to highlight Pakistan’s atrocities and human rights violations in Balochistan. He announced the platform by initiating a long march campaign in Germany on July 16. He said in a public statement that the long march in Germany would be followed by similar campaigns throughout the western world to make the people aware of Pakistan’s crimes against the Baloch people in Balochistan which he said was occupied by Pakistan forcefully in 1948. On August 4, the long march reached the town of Potsdam. The participants held a protest in front of Potsdam Hauptbahnof, the main train station. They were joined by Baloch activist Dr. Shahzavar Karimzadi from London. The activists distributed leaflets and spoke to the people about recent Pakistani attacks in Balochistan. The 700-kilometer long march started from Germany’s Dusseldorf city and reached the German capital, Berlin on August 5, where the participants and human rights activists demonstrated outside the German parliament. 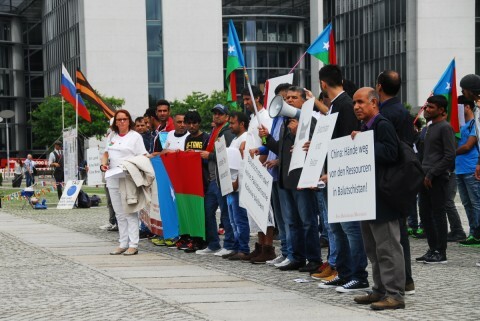 This was the first Protest of its kind by Baloch activists in Europe, which has been welcomed by Baloch people all over the world and especially in Balochistan where people have expressed their support by wall chalking and graffiti throughout Balochistan. According to the participants of the long march, the main aim of the demonstration was to shed light in the western world on the human rights abuses committed against the Baloch people by Pakistani forces. They accused Pakistan of sponsoring international Islamic terrorist groups. They also spoke out against the enforced disappearances of Baloch activists by the Pakistani army and intelligence agencies with Chinese involvement. In the last 15 years, Pakistani forces have extra-judicially killed 5,000 and abducted more than 20,000 Baloch political activists. There is not a day that passes without Baloch civilians being targeted, attacked and disappeared by Pakistani forces. On the other hand, the Pakistani media is playing a hypocritical role. It didn’t hesitate to denounce India for executing the Pakistani backed Islamic terrorist Burhan Wani. The media in Pakistan portrayed him as a hero and blamed India for human rights violations. However, they turned a blind eye during the same week when Pakistani forces attacked Balochistan’s town of Bachila, harassed women and children, burnt down mud houses and enforced the disappearance of five innocent civilians. The Long March reached in the front of German Parliament on August 5 and it turned into a demonstration where people from the Baloch diaspora living in other Europeans countries also joined the protest.